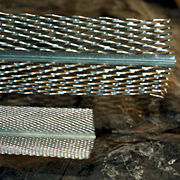 The bead on top is more rugged and allows us to correct significant irregularities. 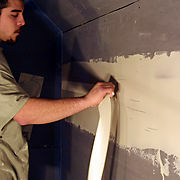 Veneer plaster is normally done over blueboard, but it is also done as part of resurfacing. Veneer is any thin application of a monolithic troweled finish to walls and ceilings. It can be done in two coats or one coat. Avalanche Plastering uses a two coat system (a finish coat over a base coat) as it results in a strong, virtually flawless surface on a true, flat plane. If it is over blueboard, we always Durabond™ the seams with paper tape. Avalanche Plastering adds this step because we believe this is the best insurance against board-seam cracks. When we install corner beads, where possible we install a wide 1-A type corner bead because they are heavy duty and enable us to plumb even a severely crooked corner. For all types of veneer plaster (both over blueboard and resurfacing), Then we apply a doubled-up coat of USG Imperial Base Coat™. 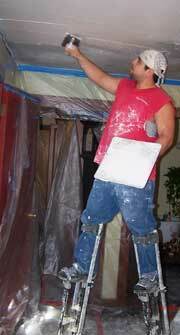 Depending the job (especially in new construction), we snap chalk lines to help straighten ceilings. We will plaster up to those guidelines. We then apply a doubled-up coat of USG Structo-Gauge™, which is job mixed with lime putty. 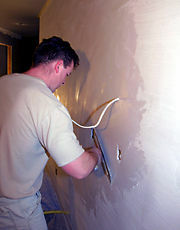 As the plaster reaches into a plastic state, it is repeatedly water troweled. With each pass, it gets smoother and more dense. This fills all the little pores. We use the trowel to packed and polish the plaster to a mirror finish. See article on Flawless Walls at FineHomebuilding.com for more information.